A great new website set up by the Hope Valley Community in Derbyshire, full of up-to-date material on the EU and related processes! Brand new campaign to make sure that under 30’s have a coherent voice in shaping Britain’s future. This is very good news to see a creative and genuinely young group emetging.. We hope to work with them! Scotland’s oldest dedicated pro-Europe, pro-EU, campaigning organisation. The EU, delivering Peace, Stability and Prosperity. Excellent selection of blogs! 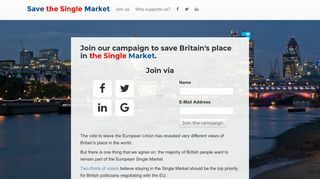 London4Europe, the London section of the all-party European Movement UK (the UK’s oldest pro-European organisation), does not believe BREXIT is a fait accompli. The WI is now the largest voluntary women’s organisation in the UK. The WI celebrated its centenary in 2015 and currently has almost 220,000 members in approximately 6,300 WIs. Ensure that women have a say in decisions that affectt them. New group of under 30s determined that the young should be given a say in post-referendum outcome processes. Campaigning to remain in EU. 4 sibsidiary campaigns for historians, classicists, lingyusts and economists. Pro Europa is passionately in favour of as close and mutually-beneficial a relationship as possible between the EU and UK, whatever the outcome of any forthcoming discussions. Say Yes is a group of several local organizations that focus on sharing information on the benefits of EU membership for citizen rights. New Europeans promotes the benefits of EU membership with a focus on the rights of EU citizens, especially the right to freedom of movement. .A group of hundreds of lawyers who consider that the UK’s interests are best served by remaining in the EU. #INtogether was the official Liberal Democrat party campaign supporting the UK’s membership of the EU. Hate is often the consequence of a loss of hope and a political articulation of despair, but given an alternative, especially one that understands and addresses their anger, most people will choose HOPE over hate. A campaign for a radical ‘in’ vote – building a community that is pro-EU even while it works towards building a stronger, reformed union that can bring about the radical social change our citizens need in the UK and across Europe. The Federal Trust is a research institute studying the interactions between regional, national, European and global levels of government. Part of the European Movement International network that has been campaigning for peace, stability, better jobs and prosperity through European integration for over 70 years. CommonGround was created in the wake of the referendum by a group of people who want to stay in the EU. Our priority now is to stop a destructive Brexit. We are seeking common ground among people who voted in different ways in the referendum. Successor to Stronger In with focus of retaining access to single market. Independent, non-party-political charity that exists to research fairness between the generations in order to protect the rights of younger and future generations in British policy-making.